This Article is about fitting the Walthers swing bridge in a removable section on my layout. 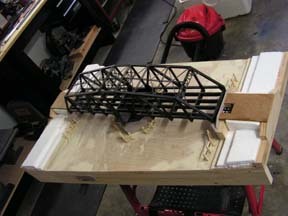 I build the swing bridge in 2002, at least that's going by the receipt I found inside the box. 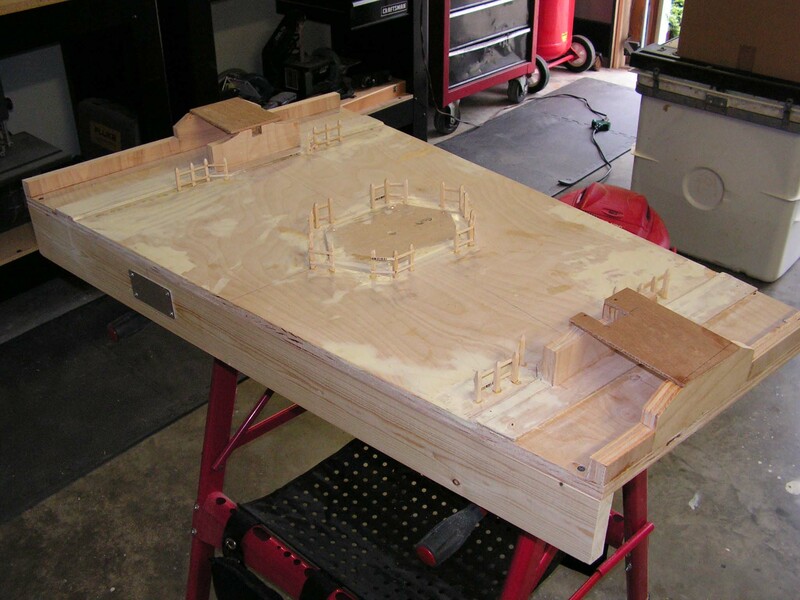 I have no pictures from building this model kit, however mechanically it is an easy kit to asemble. The electrical part of this model kit can be a bit difficult for beginners, but if you carefully look at the parts in the schematic, it should be alright. I make this removable module for my main layout located in front of a window, for the simple reason that at one time I will have to be able to reach the window in the room. In reality I will seldom have to remove the module. 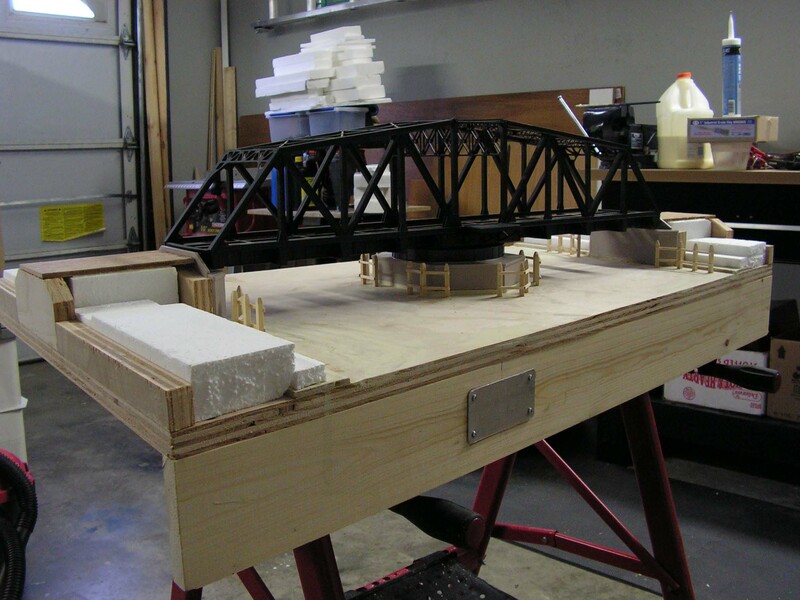 The available space on this module is big enough to place the swing bridge in closed position. 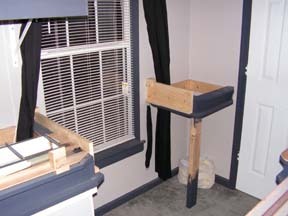 I did have to remove the curtain in front of the window, since it is in the way when the swing bridge opens. The swing bridge spans a river with wavy water, see the "silicone" water article. Both banks are made into dikes. 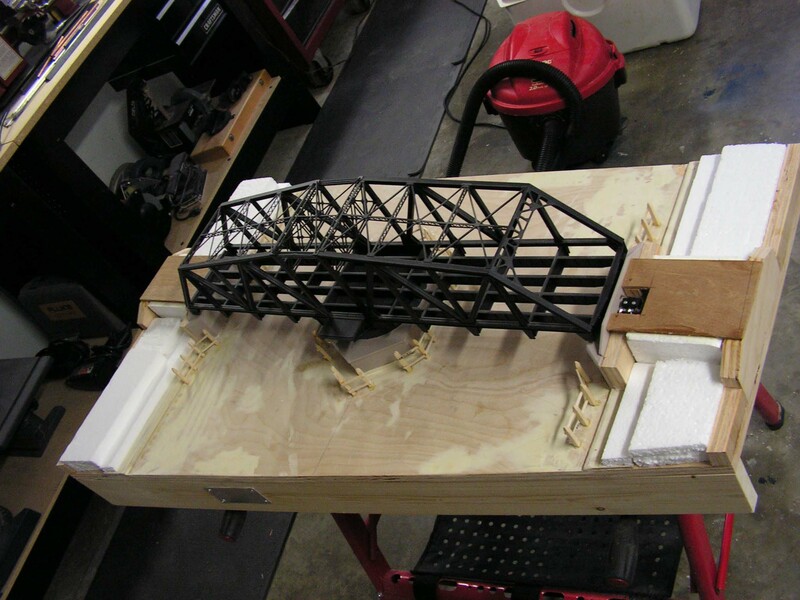 Walthers recommend to have a sturdy and flat surface to place the swing bridge on, this to insure a proper operation of the swing bridge. I have made the bottom from 3/4inch plywood and used the same plywood for the location of the abutments. 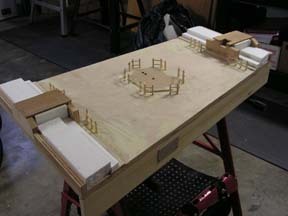 Further more the module is finished with wood to fit with the rest of the layout. 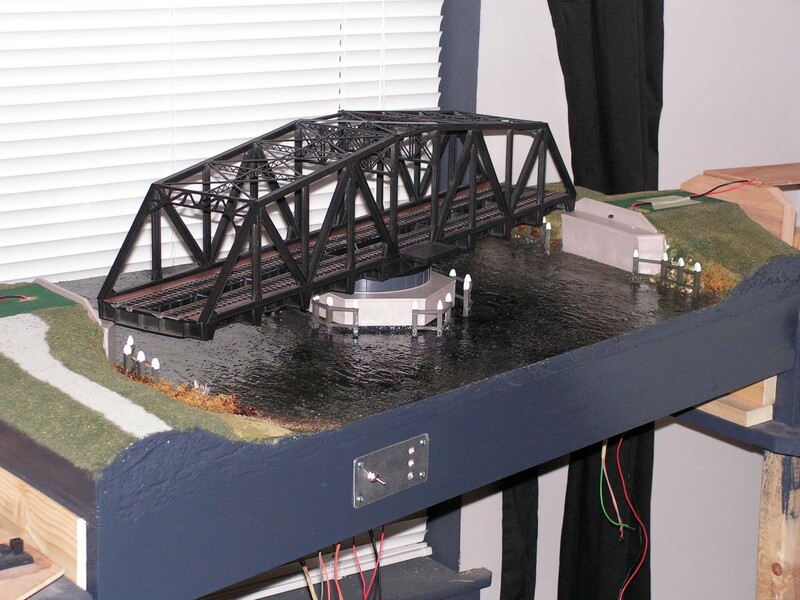 The electrical part is operated with a switch that opens and closes the swing bridge. 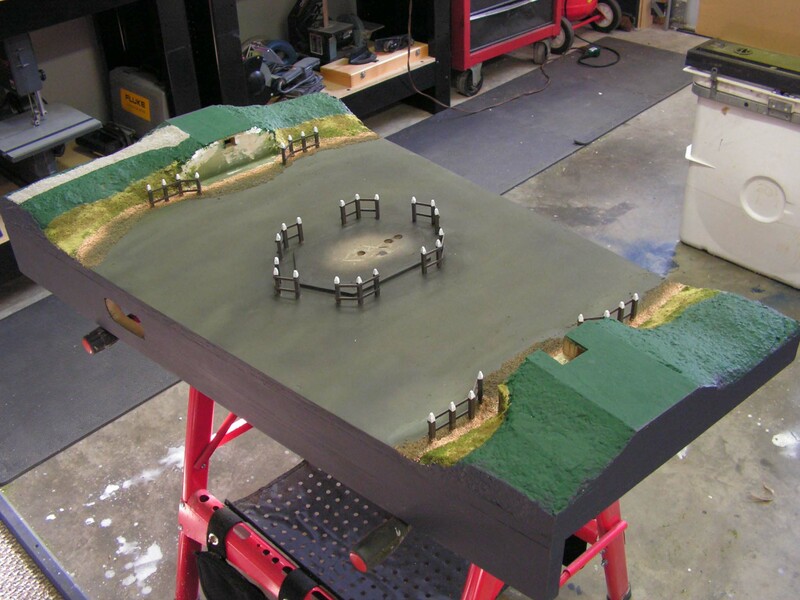 This works in conjunction with two micro switches, hidden in the swing bridge and abutment. However there is no safety build in to prevent the train from running trough the swing bridge when opened. 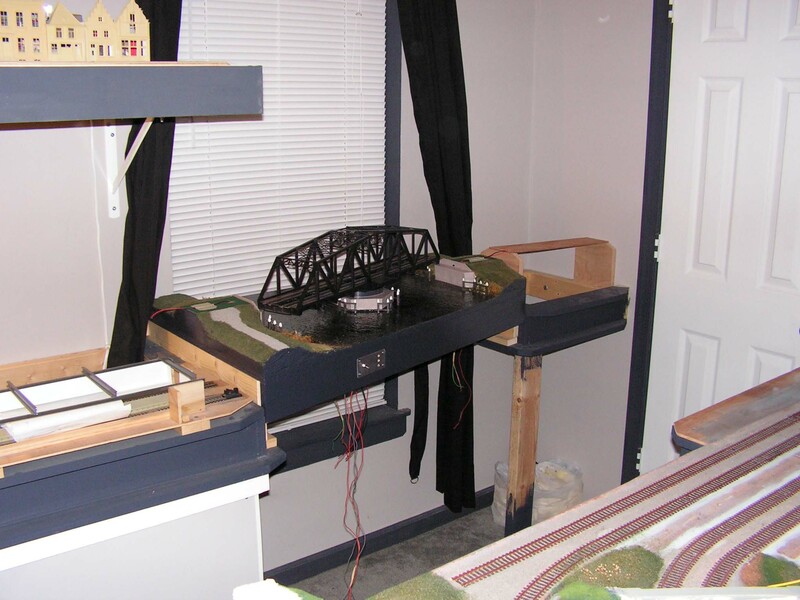 This will have to be made later and I will make an electronic circuit, operated with one switch, controlling both the operation of the swing bridge and the train safety control. I have made two video clips which shows how the swing bridge rotates. To view these video clips you need Real player or Windows media player to be installed on your computer. Click here to download the free Real player. Click here to download the free Windows media player. The clips are available for download in 3 different formats. The time it takes to download depends on your internet connection. The Walthers swing bridge in action, clip 1. 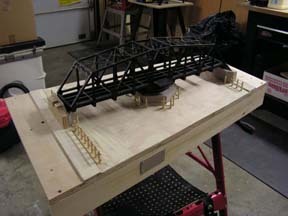 The Walthers swing bridge in action, clip2. click the image for a larger and high resolution picture. 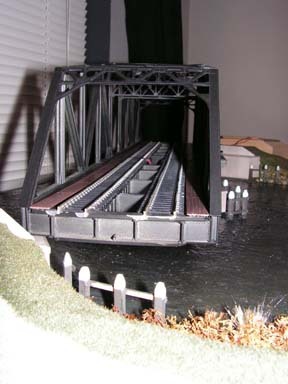 The location on my layout of the removable module with a swing bridge over a river. The swing bridge installed on the module to position the abutments for the proper location. This is a precise job in order to insure a perfect operation. 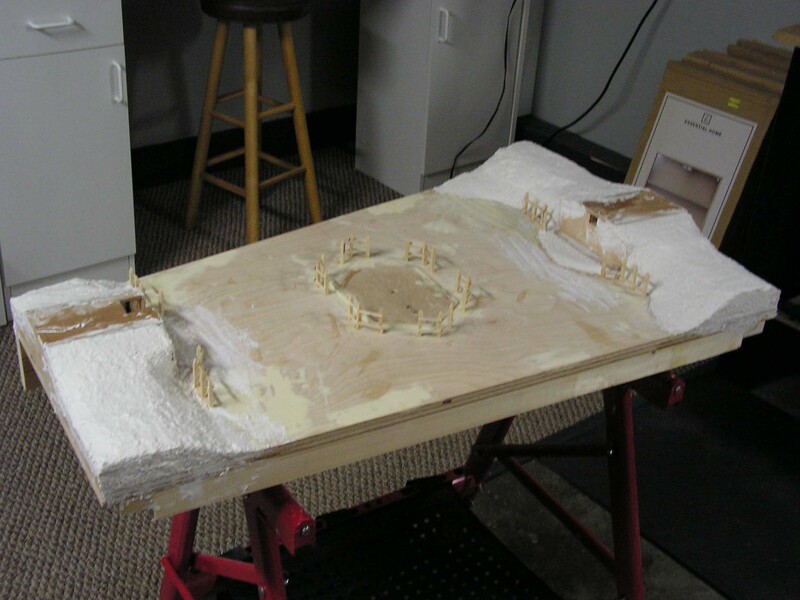 Anything that needs to be strong is made from wood, and the rest of the scenery will be made from Styrofoam and papier-mâché. The dikes are build up from Styrofoam, which is found as package material, in for example small furniture and home electronics. The swing bridge installed once again, to insure a perfect operation. 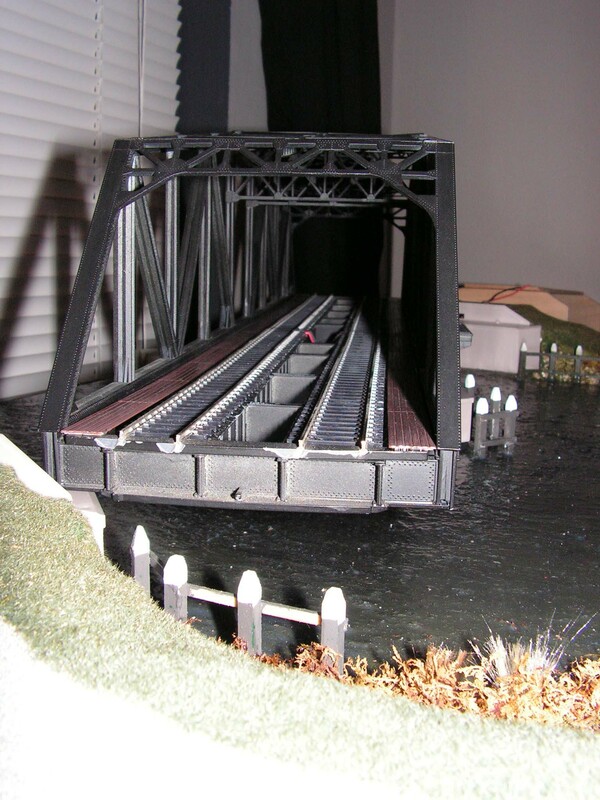 The swing bridge and the abutments have to be inline, as well have the correct height, to insure proper operation for the swing bridge itself and the passage of trains. 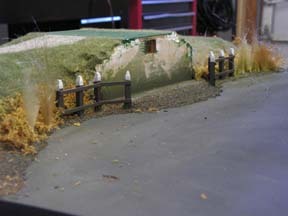 Anything lines up and building the scenery is continued with papier-mâché. 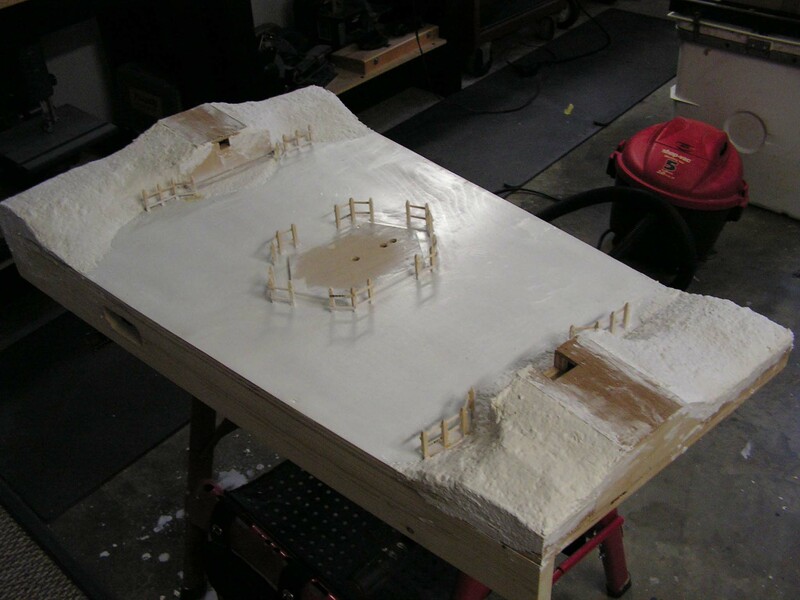 With a white primer I prepare the river to be painted in a water color. With spray-paint I the roughly color the scenery. The basis for the river I paint with a greenbrown nature color. To imitate deeper spots in the water I use some black paint. At the banks I use a lighter green. 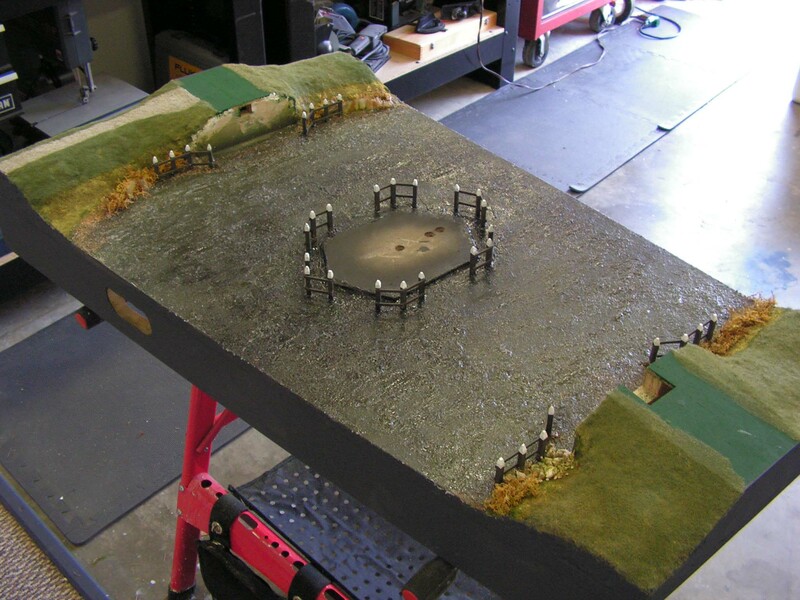 The scenery is painted and ready for the grass, turf and other materials to be applied. 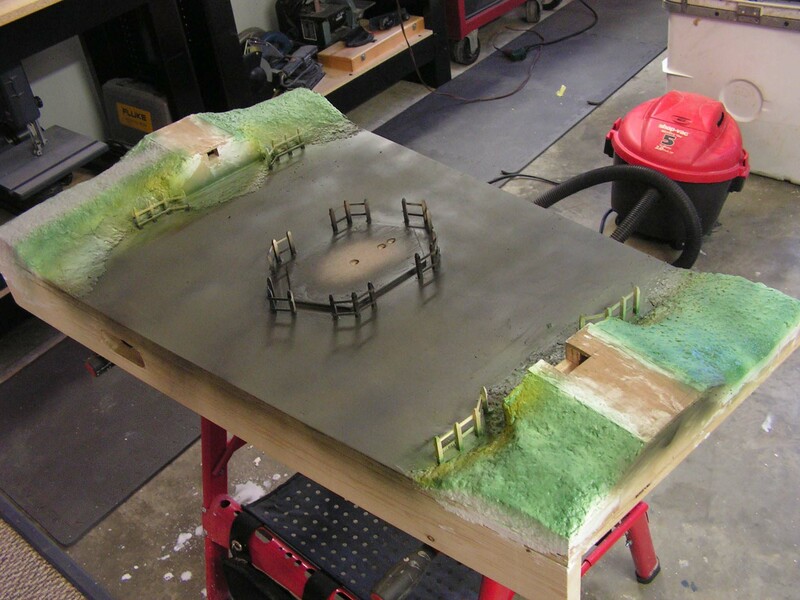 I also painted the outside of the module to match with the rest of the layout. 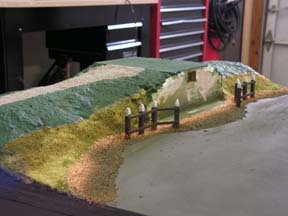 The banks are made with some turf and fine rocks / sand in different colors. 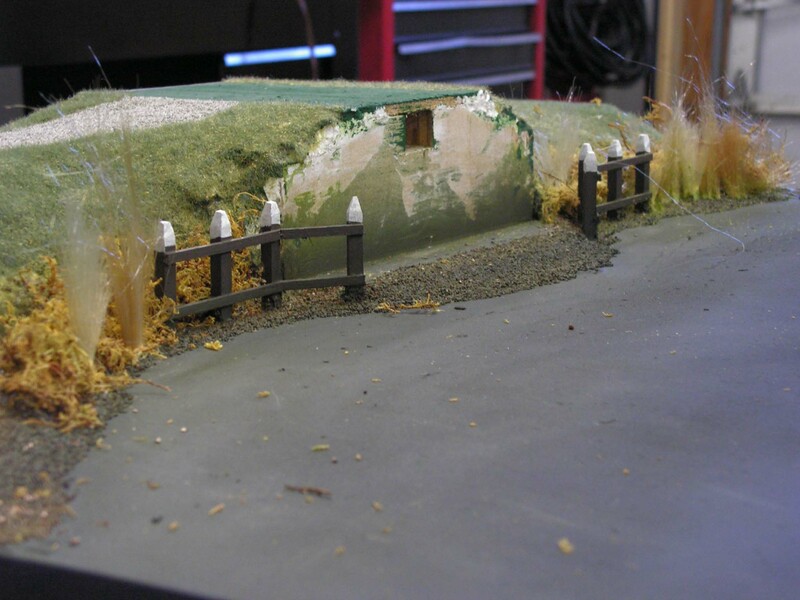 Some field grass is added and the module is ready for the "silicone" water. The module after the water is applied. The grass, by the way, is made from static grass, applied with my electronic static grass applier, see the article about static grass. The swing bridge module on its location in the layout, and temporary connected to a 6 volt battery. 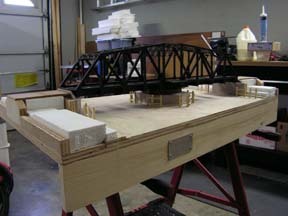 A swing bridge spans the river and the module spans the layout. The swing bridge up close as it opens. At this time the track is almost in place in the walk in closet, located behind the swing bridge. This is the line to "Belgium".